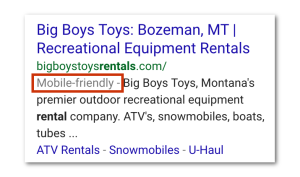 UPDATE: As of August 2016 Google will no longer display the “Mobilie-Friendly” tag in search results. The removal of the tag does not mean that they are removing the criteria from their algorithm, they are just trying to clean-up their search results. Most business owners are already aware of the importance of having a mobile friendly website. 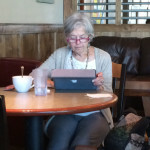 However not every business has taken the steps necessary to ensure their website appeals to a mobile audience. Well now there is actually a real deadline for brands and businesses to convert. Google recently announced on their blog, a new algorithm change that will start on April 21st which will effect large and small businesses alike. Google has been talking about their preference for mobile friendly and responsive websites for some time now – you may not have noticed, but they have even been telling mobile users which sites are responsive in their search results (see image to the left), so that users can chose results that provide a more positive user experience. The algorithm will be real-time. This means that after the algorithm change goes live, you will benefit from having a mobile-friendly site as soon as Google detects the change. The ranking factor will be evaluated on a page-by-page basis. So passing some pages, or even most pages, as mobile friendly will not mean your entire site passes the check. All pages must be mobile friendly. At Branding Iron Marketing we focus on internet marketing solutions designed to increase online visibility and convert more leads. We use a wide array of search marketing tools including SEO, social media management, mobile search, web video design and more. 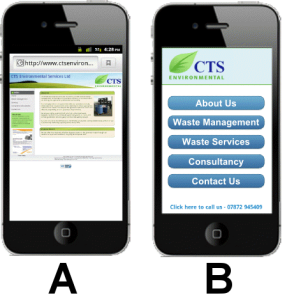 All of our websites are designed to be mobile-friendly and you don’t have to worry about breaking the bank. We offer multiple website packages that are set up to accommodate businesses of all size. Our customers benefit from the flexibility and peace of mind they get, knowing that their website will always be up-to-date. Please give us a call today at 406-581-7216!